The brisket served from from Juicy Lucy BBQ at Brisket King NYC 2019 was insanely good. It doesn't hurt to have a pitmaster from Franklin Barbecue. This past Wednesday, a new Brisket King of NYC was crowned in Brooklyn. Alternately shocking and wowing hundreds in the crowd, Richie Holmes of the not-even-open-yet Juicy Lucy BBQ on Staten Island took home top honors. The Juicy Lucy BBQ team beat out an all-star lineup of competing barbecue joints that included big names like Dinosaur Bar-B-Que, Hill Country Barbecue Market, and Pig Beach. Holmes had a secret weapon that certainly helped: Mauro “Max” Chiefari, who worked previously as a pitmaster for top Texas joint Franklin Barbecue, is working for Holmes. They served stunning sliced brisket, chopped brisket, and burnt ends paired with espresso barbecue sauce. Juicy Lucy BBQ is set to open "around May 1," Holmes said at the event. I can't wait to stop by the restaurant on Staten Island, which is admittedly a little bit of a hike for those like myself without a car. But as my barbecue colleague BBQ Tourist will tell you, good barbecue is worth traveling for. Rob Cho of Kimchi Smoke (left) won People's Choice and second place overall, while Richie Holmes of Juicy Lucy BBQ (right) took home the crown at Brisket King NYC 2019. The People's Choice winner and second place overall of Brisket King NYC 2019 went to Rob Cho of Kimchi Smoke from Westwood, New Jersey. Cho is a regular at barbecue events in New York and New Jersey and has competed at Brisket King several times. This time, he served tender brisket topped with a tangy "Kimchichurri" sauce and it stood out among the field. Cho is always one of my favorites to try because he creatively blends Korean and Texas barbecue styles. He will soon be opening a second location in Little Ferry, New Jersey. All of these folks had great items. Fulk served Hill Country's tasty brisket with pickles; Gower had a marvelous creation that included brisket with Yorkshire pudding and horseradish cream; Stage served a brisket tostada; McBride served the # (don't miss Pig Beach's BBQ benefit this Saturday); and Izzy served brisket tacos that are similar to those on the menu at the still-new Izzy's Taqueria. Kimchi Smoke's brisket at Brisket King NYC 2019 was juicy and topped with a tangy "Kimchichurri" sauce that was criminally good. Other great joints or independent operations at the event included Carlitos Tacos, Cash Only BBQ, Chef Jesse Jones, Darling Nikki’s BBQ, Judd’s Memphis Kitchen, Morgan's Brooklyn Barbecue, Ornella Trattoria Italiana, Randall’s Barbecue, and Sands Jerk Hut. I was highly impressed by the burnt ends being served by Morgan's, the Italian-style brisket from Ornella, the brisket tostadas from Carlitos, and the brisket in a cup from Cash Only BBQ. John Stage, co-founder of Dinosaur Bar-B-Que, was on hand at Brisket King NYC 2019 and served a great brisket tostada. All in all, this was a rousing return to glory for Brisket King, showcasing both new and veteran players at their best. Last year's event was hot and overcrowded, but thankfully the set up was much better this year and everyone seemed to have a good time. The next big competitive barbecue event that should be on your calendar is Rib King NYC 2019 — curated by yours truly — and it takes place Thursday, May 30 in Brooklyn. It's going to be a blast, and I hope to see you all there. Just in time for nice weather, Mothership Meat Company has opened in Astoria. It has a comfy outdoor area for eating barbecue. After more than three years of waiting, Mothership Meat Companyopened last night in Astoria. The restaurant, from the team behind John Brown Smokehouse, will be open during its first two weeks with the following hours: Thursday to Sunday from 5 p.m. to midnight. NYC BBQ and BBQ Tourist, co-founders of The Smoke Sheet, were featured on Canada’s Eat More Barbecue podcast, talking about the state of barbecue across the U.S. This Saturday, Hugh Mangum of Mighty Quinn’s Barbecue, will be “Everesting” at the East Village location to raise money for the great charity No Kid Hungry. They will also be offering an insane Burnt Ends Philly Cheesesteak special this weekend as well, so both good reasons to say hello to Hugh. The NYC BBQ Cookoff was held this past weekend on Staten Island, attracting thousands of enthusiasts. For the competition, Uncle Pigs BBQ Pit, Top Gun Barbecue, and Smokin Hoggz placed as the top three teams overall. On Sunday night, Game of Thrones fans who also love barbecue might want to stop by Dekalb Market Hall in Downtown Brooklyn. They’ll be hosting a GoT watch party with food from Fletcher’s Brooklyn Barbecue. Don’t miss this Saturday’s incredible barbecue benefit at Pig Beach with pitmasters from all over the country. April 12: Today, Smorgasburg is officially opening a new location in Lower Manhattan, next to the Oculus at the World Trade Center. Every Friday through October, from 11:30am to 7pm, it will be open on Fulton Street between Church and Greenwich Streets. 25 food vendors of all kinds will be there. More info here. April 25-28: Pig Beach will be hosting two very cool events in late April, including a collaboration with acclaimed Georgia joint Southern Soul BBQ (on April 25 and 26) and its second annual Crawfish Boil with BBQ Ninja Craig Verhage (on April 27 and 28). Buy tickets to Southern Soul and/or to the Crawfish Boil. 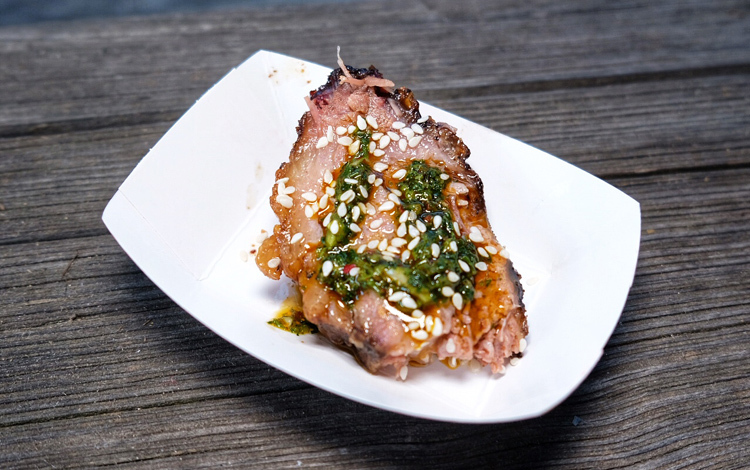 April 27: If you’re looking for fun in Bushwick, you won’t want to miss Pig Out at Bunker. At celebrity chef Jimmy Tu's Bushwick restaurant Bunker, you’ll find a party with a whole roasted Heritage Berkshire hog, locally sourced beers and cocktails, great music, and more. Buy tickets here.